Alveolar soft part sarcoma is a rare tumor affecting mainly adolescent and young children. It presents as a slowly growing tumor and is usually overlooked due to lack of symptoms. Early metastasis is a characteristic feature of this tumor and, in a good number of cases, metastasis to the lung or brain is the first manifestation of the disease. In this report, we present a case of alveolar soft part sarcoma predominantly located in the right frontal bone with dural breach and contiguous right frontal lobe involvement in a 17-year-old girl without any evident primary or other secondaries. A brief review of literature is also presented. Alveolar soft part sarcoma (ASPS), a rare tumor occurring in adolescent and young children, mainly manifests in the head and neck region with the tongue being the second most common site of involvement. These tumors metastasize early. The disease has often been detected following metastasis to the lung or brain that led to investigations to locate the primary site of the tumor. Primary involvement of the cranium as the first manifestation is extremely rare. In all these cases, the patients also had a concomitant pulmonary metastasis. 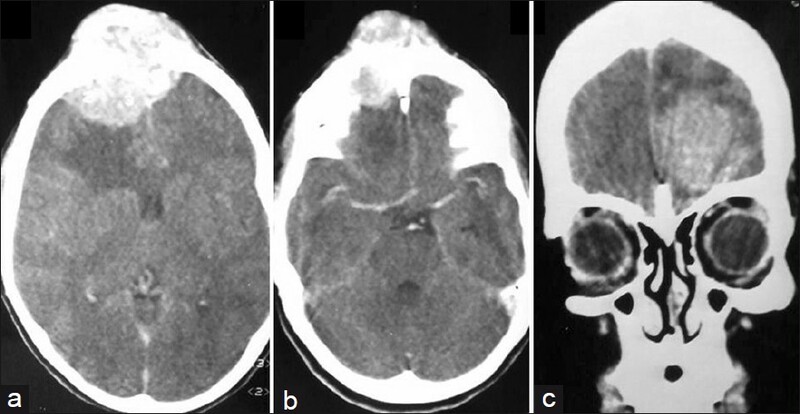 In this report, which is the first of its kind, we report a 17-year-old girl who presented with an isolated skull lesion with infiltration into the adjacent brain without any detectable primary site of involvement or other metastatic lesions. A brief review of the relevant literature is also included. A 17-year-old girl presented with a painless progressive tumor in the middle of the forehead of 1-year duration that had shown a rapid increase in size in the last 4 months. Her examination revealed an irregular well-defined tumor involving the middle of the forehead extending from 2 cm behind the hairline to almost up to the bridge of the nose. The tumor was variegated in consistency with slightly raised temperature of the overlying stretched and shiny skin. Her neurological examination was essentially normal. Her contrast-enhanced computed tomographic (CECT) scan revealed a hyperdense mass with irregular outline involving the right frontal lobe with calcification with heterogenous postcontrast enhancement and grade II perilesional edema. There was destruction of the overlying bony calvaria and an additional extracalvarial extension of the tumor [Figure 1]. Her abdominal ultrasound, bone scan, and chest X-ray were normal. At surgery, a bicoronal scalp flap revealed a reddish tumor infiltrating into the calvarium and dura with invasion into the adjacent frontal lobe. Initially the extradural portion of the tumor was removed and the involved frontal bone was rongeured until the feel of normal bone was obtained. Then the frontal dura was opened, the anterior part of the superior sagittal sinus ligated, and the falx cerebri divided. The tumor infiltrating into the right frontal lobe was excised. 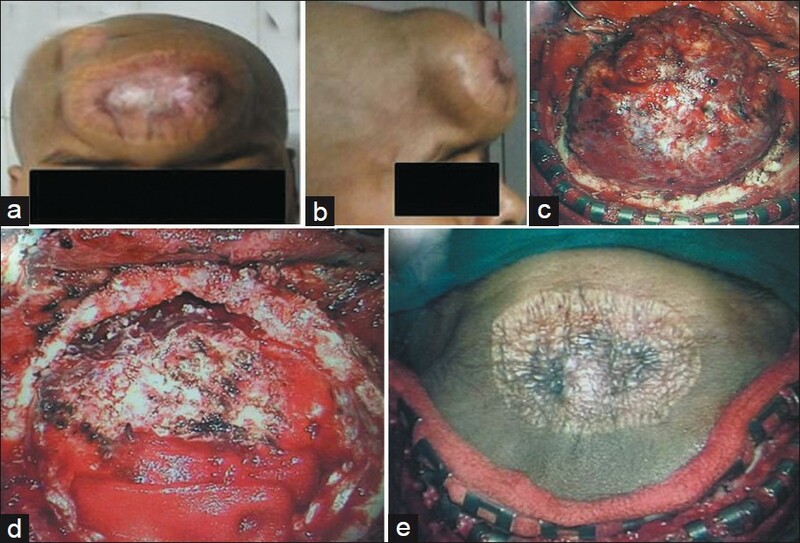 The involved dura was excised and after performing a duroplasty using the pericranium, the scalp was closed in layers [Figure 2]. The postoperative period was uneventful. Her biopsy revealed an alveolar soft part sarcoma [Figure 3]. She was referred for adjuvant radiotherapy. A follow-up after 4 months did not reveal any recurrence of the lesion. Grossly these tumors are soft, poorly circumscribed, gray to yellow in color with areas of hemorrhage and necrosis especially in larger tumors. The most characteristic light microscopic feature best seen at low magnification is the organoid or nesting pattern separated by thin fibrovascular septa. Cells present in the center of the nests undergo necrosis and are loosely arranged resulting in a pseudoalveolar pattern; hence the tumor is named as "alveolar." Round to polygonal tumor cells with sharply defined cell borders show commonly one to rarely as many as five vescicular nuclei with prominent nucleoli and abundant eosinophilic, clear or vacuolated, finely granular cytoplasm. Mitotic figures are uncommon. Cells often have rhomboid or rod-shaped crystalline inclusions that may be faintly apparent on hematoxylin-and-eosin stained histological preparations but can be better demonstrated with PAS stain after diastase digestion. They can be seen in virtually every tumor cell in some cases, while they may be rare or even absent in others. These crystals represent complexes of proteins monocarboxylase transporter 1 and CD 147. , A variable amount of glycogen and diastase-resistant granules probably representing precursors of these crystals may be seen. Vascular invasion is an almost invariable feature. Brain metastasis is not a common feature with soft tissue sarcomas; ASPS, due to its indolent nature, is an exception to this rule  with 15-19% of them having intracranial metastasis during the course of the disease. , Metastasis to the brain usually occurs late during the course of the disease with these patients often harboring concurrent pulmonary metastasis. Presentation of ASPS with solely cranial metastasis with an occult primary lesion is extremely rare and only three cases have been reported so far ,, [Table 1]. In all these three cases, however, a detailed investigation revealed a coexisting pulmonary metastasis along with the presence of the cranial lesion. Our case was unique with an isolated calvarial and contiguous brain lesion with neither evidence of any primary lesion nor of other metastatic lesions. Either alone or in combination, surgery and radiotherapy are the favored modes of therapy in such situations. Chemotherapy, although effective for the primary lesion, has not been found to be helpful in metastasis to brain primarily because of inability of these drugs to cross the blood--brain barrier. The aim of surgery is complete tumor excision. Adequate excision translates into improved outcome in such patients. In the study by Chou et al.,  postbrain metastasis survival was 14.53 months in patients with ASPS patients who underwent excision compared to 1.23 months observed in non-ASPS brain metastases (P=0.003). Radiotherapy produces better local control after surgery or may be used as an adjuvant palliative therapy in patients with multiple cerebral metastases. There are recent reports indicating promising results with sunitinib, a tyrosine kinase inhibitor, in metastatic ASPS of the brain , as this drug has been found to have an adequate blood-brain barrier penetration. Considering the high likelihood of brain metastasis in patients with ASPS, routine periodic surveillance with magnetic resonance imaging of the brain and positron emission tomographic scan following primary excision seems to be an appropriate line of management for early detection of recurrence/monitoring of residual lesions for possible early intervention in such cases. ASPS should be considered as a differential diagnosis in metastatic lesions of the brain. Its comparatively indolent course when compared with other metastatic soft tissue sarcomas ensures a reasonable long term outcome following surgical excision and radiotherapy. 1. Enzinger FM, Weis SW. Malignant tumors of uncertain type. In: Soft tissue tumors. 4 th ed. London: St Louis, Mosby; 2001. p. 1509-21. 2. Christopherson WM, Foote FW Jr, Stewart FW. Alveolar soft part sarcoma: structurally characteristic tumors of uncertain histogenesis. Cancer 1952;5:100-11. 3. Portera CA Jr, Ho V, Patel SR, Hunt KK, Feig BW, Respondek PM, et al. Alveolar soft part sarcoma: Clinical course and patterns of metastasis in 70 patients treated at a single institution. Cancer 2001;91:585-91. 4. Fassenbender HG. Alveolar myoblastic sarcoma of the skeletal musculature. Oncologia 1960;13:184-91. 5. Welsh RA, Bray DM 3rd, Shipkey FH, Meyer AT. Histopathogenesis of Alveolar soft part sarcoma. Cancer 1972;29:191-204. 6. Miettinen M, Ekfors T. Alveolar soft part sarcoma: Immunohistochemical evidence for muscle cell differentiation. Am J Clin Pathol 1990;93:32-8. 7. Mukai M, Torikata C, Iri H, Mikata A, Hanaoka H, Kato K, et al. 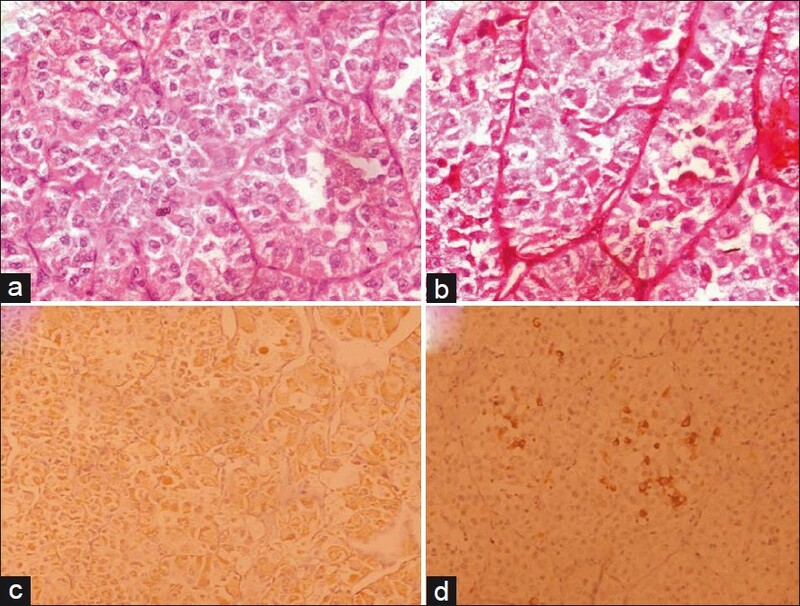 Histogenesis of Alveolar soft part sarcoma: An immunohistochemical and biochemical study. Am J Surg Pathol 1986;10:212-8. 8. Shipkey FH, Lieberman PH, Foote FW Jr, Stewart FW. Ultrastructure of alveolar soft part sarcoma. Cancer 1964;17:821-30. 9. Ladanyi M, Antonescu CR, Drobnjak M, Baren A, Lui MY, Golde DW et al. The precrystalline cytoplasmic granules of alveolar soft part sarcoma contain monocarboxylate transporter 1 and CD 147. Am J Pathol 2002;160:1215-21. 10. Ogose A, Morita T, Hotta T, Kobayashi H, Otsuka H, Hirata Y et al. Brain metastases in musculoskeletal sarcomas. Jpn J Clin Oncol 1999;29:245-7. 11. Lieberman PH, Foote FW Jr, Stewart FW, Berg JW. Alveolar soft part sarcoma. JAMA 1966;198:1047-51. 12. Kayton ML, Meyers P, Wexler LH, Gerald WL, LaQuaglia MP. Clinical presentation, treatment, and outcome of alveolar soft part sarcoma in children, adolescents, and young adults. J Pediatr Surg 2006;41:187-93. 13. Lewis AJ. Sarcoma metastatic to brain. Cancer 1988;61:593-601. 14. Perry JR, Bilbao JM. Metastatic alveolar soft-part sarcoma presenting as a dural-based cerebral mass. Neurosurgery 1994;34:168-70. 15. Sujit Kumar GS, Chacko G, Chacko AG, Rajshekhar V. Alveolar soft-part sarcoma metastases. Neurol India 2004;52:257-8. 16. Lokich JJ. The management of cerebral metastasis. JAMA 1975;234:748-51. 17. Bindal RK, Sawaya RE, Leavens ME, Taylor SH, Guinee VF. Sarcoma metastatic to the brain: Results of surgical treatment. Neurosurgery 1994;35:185-91. 18. Chou YS, Liu CY, Chen WM, Chen TH, Chen PC, Wu HT, et al. Brain, the last fortress of sarcoma: similar dismal outcome but discrepancy of timing of brain metastasis in bone and soft tissue sarcoma. J Surg Oncol 2011;104:765-70. 19. Stacchiotti S, Negri T, Zaffaroni N, Palassini E, Morosi C, Brich S, et al. Response to sunitinib malate in advanced alveolar soft part sarcoma. Clin Cancer Res 2009;15:1096-104. 20. Stacchiotti S, Negri T, Zaffaroni N, Palassini E, Morosi C, Brich S, et al. Sunitinib in advanced alveolar soft part sarcoma: Evidence of a direct antitumor effect. Ann Oncol 2011;22:1682-90. Ahn, S.H., Lee, J.Y., Wang, K.-C., (...), Phi, J.H., Kim, S.-K.